Just a heads up that it might be a little chilly at The Meeting Place tomorrow morning, so dress accordingly. Our gas account just got set up and they have to restart service. Sorry! Give them a call if you have questions or need directions. We’re looking for more people to run Sound and Slides so that we can expand to 3 Worship Teams. Contact worship. There will be a Worship Team Meeting in a few weeks at Pastor Adam’s home. Anyone interested in being a part of this ministry is invited. More details to come. If you’ve been coming awhile to Immanuel but haven’t yet become a member, go through this packet this week and stay after service this Sunday (10/23) for a free lunch and ‘Mission Class’. Alderman Fioretti would like to have one of the areas of focus for this Saturday’s 2nd Ward Clean & Green be the immediate vicinity of The Meeting Place! It would be really neat to have a good turn out of people from Immanuel there. So if you have some free time this Saturday (10/15), come to the National Italian American Sports Hall of Fame on Taylor at 10:00 AM and from there we will get snacks, directions, and equipment to go out and improve the area right around our space. It’s our neighborhood. Let’s make a difference! Part of our vision comes from Jeremiah 29 and involves being a community that’s mostly (though not exclusively) comprised of people who ‘settle down’ in the city with long-term gospel intentionality. A large part of seeing this vision realized involves encouraging, supporting, and resourcing families with kids so that they can stay in the city. That’s why we’ve put together an evening on Saturday, November 19th, from 5:30 to 7:30 PM at The Meeting Place to come hear about and discuss candidly the challenges and benefits of raising kids in the city. We’ve invited Pastor Qusai Mahmud of PilsenCommunityChurch (a new church plant we are supporting) and his wife Denise to come share their journey and take questions. They have raised/are raising seven kids in the UIC Area! The evening will include dinner and Pastor Q’s older kids will be providing childcare free of charge. 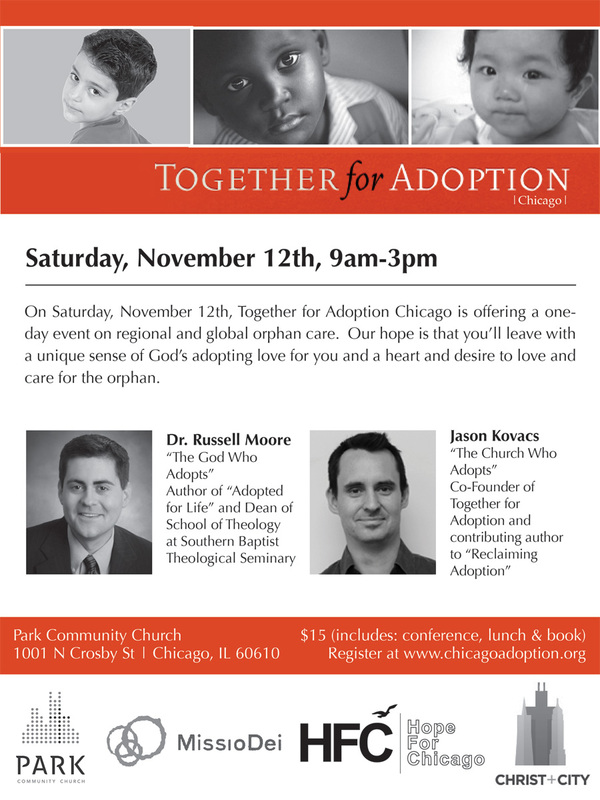 This is open to anyone – current parents, couples who don’t have kids, or anyone interested in the topic! Come with lots of questions! Every second Saturday of the month there’s a round table discussion over lunch at Nathan & Andrea’s. We’ve covered all kinds of topics related to theology. It’s open to anyone and everyone. This month we’re talking about the idea of ‘Unconditional Election’. RSVP to Phil (askforbreakfast) if you plan to come.